This is the free version of Kerli WordPress Theme with basic functionality. Kerli lite is simple and light WordPress theme. Suitable for personal blog, photography, magazine, publishing, business and any kind of sites. Kerli is a theme that has a high quality feel while remaining simple. Unnecessary frills have been cut out and emphasis has been put on attractive layouts and typography. Make it yours with a custom logo or header image, custom menu, background and more. The theme options of Kerli are implemented in the WordPress theme customizer including live preview. Kerli lite has been coded with care and by keeping performance best practices and WordPress coding standards in mind. Kerli lite has been coded with keeping SEO best practices in mind to create a solid fundament for good rankings. Kerli lite is distributed under the terms of the GNU GPL. You may customize the theme in every way you want. If you like Kerli lite WordPress Theme, you will LOVE the premium version. 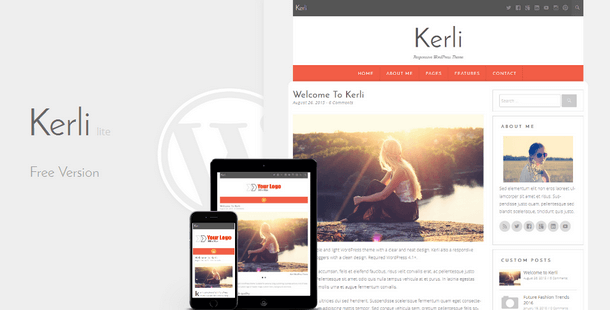 The premium version of Kerli WordPress Theme offers many more great features and options. Configure your own news website or blog within a few minutes and benefit from endless possibilities to customize your website. Learn more about the premium version of Kerli.